Being honest with ourselves, "healthcare" as we know it has become a monster of our own doing. The use of care extenders is nothing novel; at the base of it, this is just a "strategy" of cheaper labor. You get for what you pay for; quality always suffers when downsizing and substituting. The gatekeeper model has failed. WE have failed. Consumers seek value; not information or rationing of products and services. Unity is paramount to success in healthcare. Value Based Healthcare is the solution to breaking out of the Success Dilemma. I propose that Value Based Healthcare requires two things before it can truly come to fruition. As healthcare as an industry can no longer sustain fee-for-service reimbursement and hourly-based pay, we need to restructure the financial workings and supply chain effects so that VALUE is the currency at hand. To do this, we will very likely need to see a relative blunting of compensation for the continuum of healthcare providers based on contributed value. Physicians can no longer serve as arbiter and absolute authority of the care team. Instead, the CONSUMER must take this role; responsible for their own health, both personally (as it is, of course their health), financially (as a consumer), and systemically (as a return customer). Content experts will take point of care for each case while an entire network of providers provide integral care throughout the life span of the patient. Proposition #1 will probably cause the most upheaval if not outright angst against the very idea. But, just bear with me. We are discussing a re-evaluation of how we use our resources and how we can be more responsible about it. Again, I refer to the prior mention: Is it realistically worth ANYONE's time for a physician to sit down in person and educate a patient about how an antibiotic won't cure a flu when other processes can be laid in place for the same qualitative effect with better quantitative measures? Does it sound better or worse that the physician will bill a $100-200 dollars for that 4 minute visit? It sounds awful! So, instead of fee-for-service paradigm, I would propose and reasonable surmise that value based compensation will cause a blunting effect since those 4 minutes are not likely very valuable. 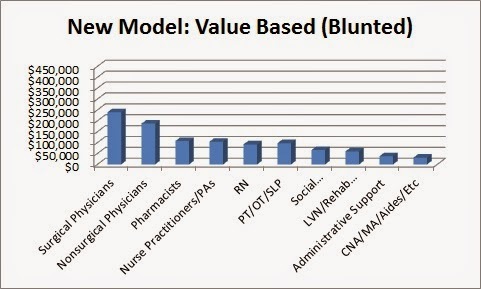 The following is a table and graphs of the value based blunting effect and is only a theoretical estimate based on financials that healthcare can become sustainable in the long run (beyond the bickering of extenders and best practice). Why do I even DARE to suggest this? Aren't I afraid the AMA and other healthcare godfathers will come after me? Nope... Because, the recent literature in health sciences have shown us that many of the interventions we've touted aren't actually causing the effect we had hoped. Bluntly put, there are many unnecessary surgeries, interventions, drug prescriptions and the like which are truly affecting the broad spectrum of population based health outcomes. And, guess who is most vocal about this? PHYSICIANS! The ones who became medical doctors because it was a calling, not an earning. They are thought leading, sacrificing their own pocketbooks for the betterment of us all -- and, kudos to them! But, back on the main issue at hand, consumers don't value visits. They value timely access, effective intervention, and long lasting outcomes. They value the CNA when no one else can help them clean themselves in the hospital. They value the PT when no one else will listen about their chronic pain. They value the social worker when they've lost all hope on how to pay for their bills. THAT is what the healthcare consumer values. As such, we need the professionals who are the content experts to be directly accessible to the consumers such that they don't go through some gatekeeper, wait in line and a funnel system which only serves as temporal-crowd-control-barriers to their good health. Moreover, so much resource in time, repeat visits, repeat tests, and "failed conservative care" are used to "justify" "medical necessity" of big name drugs, surgeries, equipment, etc. that would quite likely never have been wasted would be averted if the content expert was directly consulted in the first place. This proposal means that the healthcare supply chain needs itself to change; it can no longer be linear. It must be agile and multidimensional; it must be a well tuned, collaborative, data focused, tech driven, consumer oriented cooperative that ALL internal stakeholders value consumer outcomes above their own billed hours. Under a value based system, fee-for-service disappears, and therefore, much of the conflict of interest of a "follow up visit" or the "mechanic's dilemma" disappears. It also means the initial blunting is just that, initial. This is just a mock-up of what could be; those who contribute more value get paid more for their value. Those that don't... don't. The system would have to iteratively re-evaluate what is and isn't valuable, and, how much value it actually is worth -- the system, driven by the healthcare consumer. Imagine that, get paid for the worth of what you do. This proposal also means academic institutions and professional organizations will need to also get honest with themselves as well; what is the real value (or cost to student) of education, and therefore, what is the best mode of said education? Questions a little beyond my scope of expertise at the moment. This value based system will have a blunting effect carrying over as a value based compensation for healthcare providers, from the CNA all the way "up to" the neuro surgeon. After all, it is no long service people want, it is VALUE. Now, I made all this reference about CSR and social responsibility as a whole. Therefore, let me run this through some CSR frameworks and an ethical screen to demonstrate that it fits the mold, and therefore, is a recommendation worthy to be considered as a prototype solution. Going beyond direct access and into the forays of a truly collaborative community of healthcare providers who are paid by value added versus service rendered, this is my CSR analysis. It also serves to explain Proposition #2 in the section 3(b) above. Be economically/financially responsible (create value, earn money). Be legal (obey the laws, play within the rules). Be ethical (be moral, act socially respectable & responsible). Be a good corporate citizen (philanthropy, paying it forward, giving back). I hope we can agree that a value based, collaborative system with direct channels to content experts is FAR superior to a gatekeeper and justification mechanism. Instead, if ALL providers were empowered by society (laws and all) to practice at the top of their credentials, so much would be solved in this regard. I have a physician/medical director to thank for this part of this idea from way back when (but, he has yet given me okay to name him publically. No worries, his thoughts have already been recognized at official ranks of national policy concerns and will be published soon and therefore I respect his privacy) -- nevertheless, there has been a name given this functional model to which I credit him once he feels ready. This solution is not leader based; it is network based. A network of healthcare providers lead by mutual interests of the consumer's best health. It has nothing to do with who gets what piece of the pie. It has nothing to do with who is billing for what. It has to do with who is contributing, and, to what value is that contribution represents in the lives of our consumers. Be economically/financially responsible: Value based, agile network model will allow for consumers to lead with their market demand and their dollars for an entire collaboration of healthcare providers to optimize resource use per outcome. Pass. Be legal: Instead of finding loopholes for extenders, billing creatively and what not, this agile model will already connect a direct line for a basic health concerns to NP/PA/PT, etc. In cases such as an emergent concern, it goes directly to an urgent care/emergency physician. For musculoskeletal concerns, a physical therapist. Therefore, best candidate within the network of providers to best address the concern is operationally (and legally) highlighted as the case lead in a specific circumstance of patient concern. Pass. Be ethical (be moral, act socially respectable & responsible). This value based, agile network model also provides care accessible in an on demand/ASAP basis. This is excellent because society wants their health concerns addressed NOW. Not after a 6 week health scare. Not after going through several hoops of failed conservative measures. They want their concerns to be treated as such; CONCERNS! Pass. Be a good corporate citizen (philanthropy, paying it forward, giving back). While the value based, agile network model may not directly contribute funds back to society, what it will do is set up society to adopt a culture of health. This is something Western culture has desperately struggled against. Pursuit of best health seems to be an arduous task. This model will allow for PTs, OTs, RNs, dieticians.nutritionists, social works, counselors and like-minded professionals to keep consumers aware, accountable, and active in their own health. Pass. Since the conditions of social responsibility are sufficed, let's make sure a micro-version of an Ethics Screen is also passed for extra measure. By the way, I challenge you to try fitting any one of our current models (or suggested models) through the Ethics Screen (via Carroll). It will likely fail. Is this the best representation of healthcare as an organization of sorts? Conventional Model: Fails. Why back our consumers up and make them assume a holding pattern in the supply chain? Agile Model: There is no holding pattern in this model and the supply chain is networked so that consumers are served as directly as possible. PASS. Is this the best representation of societal concerns? Conventional Model: With all the political and social upheaval on affordable healthcare and what not, I'd say this is a definite fail. Things are not working at present (circa 2015). Agile Model: Society is familiar with agile access to products and services. Look at Amazon, Google, Ebay, etc. People KNOW where to get the answers. They go there directly. Healthcare has been trying to safeguard its secrets; it's infantile since all of our "secrets" are already out there. Consumers that don't know who they need are victims of our selfishness. Consumers who know who they need are frustrated by the conventional model. Agile network access to healthcare = PASS. Principles Approach (Just to save blog space and you're reading time, I'll hold off on this section to compare and such... all to say: Yes, the Value Based, Agile Network model passes). Does this model have utilitarian benefits? Does this model have virtue? Is this model following the Golden Rule? Does this model suffice Common Sense? Duh! This model is practically the model for every other industry. This is a Pass. Is this model a representation of "One's Best Self?" I think the Agile Model is definitely a representation of healthcare's best self; having content experts directly connected to patient concerns while the network of providers assume consultative and collaborative roles to the lead of the content expert is a GREAT way of expressing our best self. Musculoskeletal concern? Why not a physical therapist take lead, internist & pharmacists consult regarding any medication concerns, have pain psychology and social work hover as support? I can't give a reason, why not! Pass. Does this model pass the "Gag Test?" To this, I'll just say that many of the "extender" conversations I've heard does NOT pass the Gag Test. If it makes you gag even a little, it's a fail. WRAPPING THIS MONSTROUS BLOG POST UP! In my humble opinion, healthcare is at a crossroads where: We can all win; and, we can all win together. Or... we can all lose, one by one until it's all tragically and agonizingly gone. We caused this problem together. Times got tough, so we billed more (creatively), downsized, used cheaper labor, etc. We found ways to make people wait, or stay away, to our benefit. Or, we got them to come back regularly, to our benefit. 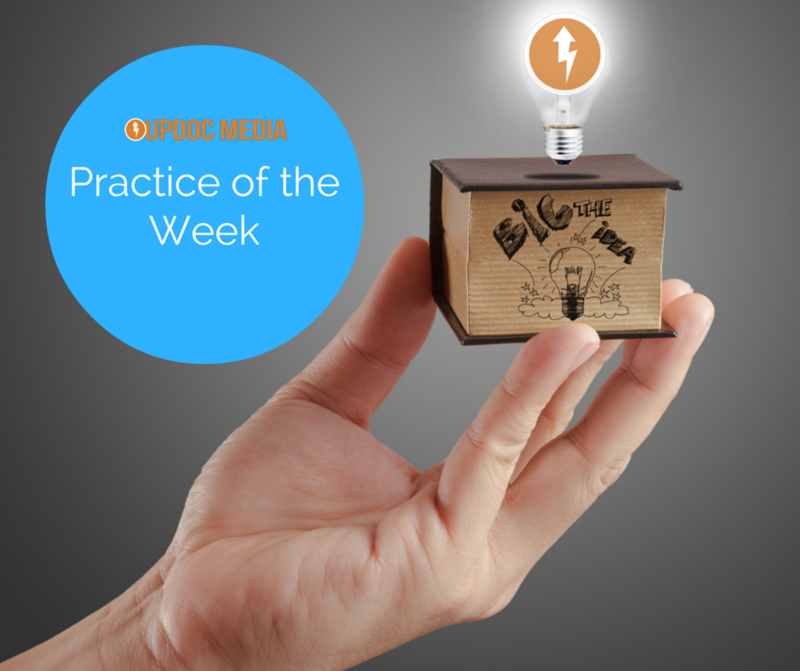 We created our own bottlenecks, gatekeepers, and circular referral processes. Payers started noticing what we were doing, so they kept decreasing what they were willing to pay because obviously we were trying to increase what we were going to fairly get. Around and around this went until we come to now: a breaking point. The conventional model as we know it has failed. We need to STOP redesigning the horse and buggy and we need to start crafting the horseless carriage. I've covered organizational, cultural, professional, financial, and societal perspectives on this problem... this Success Dilemma in Healthcare. I humbly present my recommendation as proposed, for healthcare to adopt a Value Based Agile Network model. This keeps people healthy and directly connects them to the expert of best position when a concern comes up, all the while being supported by the entire community of healthcare professionals in a collaborative network. It capitalizes on what our society is doing best, right now: TECHNOLOGY. And, it returns healthcare back to the core of it's identity: HUMANITY. This model acknowledges that information is everywhere... the rationing, distribution, and social monopolization of health information/services is no longer seen as fair nor acceptable. Therefore, this model provides healthcare in a fashion which society deems responsible. The appropriately lower margins of costs driven by "value based provider compensation" makes the burden of healthcare more evenly dispersed across the continuum providers and the consumers. Moreover, it is sustainable. Rather than an interventive, reactive pattern to which so often, things come up typically too little, too late (like running around with a garden hose, hoping it will reach all the hotspots of a fire)... the Agile Network model serves the consumer on both an on demand basis as well as via an integral approach, taking many snapshots of a patient's health over small bits of time to assure there are no alarming trends towards disease, dysfunction, or disability. 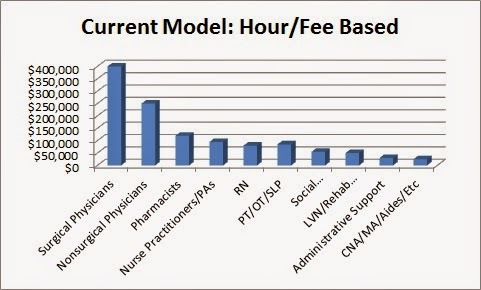 The Value Based Network Model has the greatest scope of reach with the highest levels of credenced practice for all providers in the network. Moreover, it directly connects consumers for early intervention, serves as a preventive and proactive measure, and is highly educative to its consumers such that consumers benefit through the lifespan of their health needs versus a dissociated event-by-event basis. Most importantly, the Value Based Network Model breaks out of the Success Dilemma. Instead of beating the same horse to move the same buggy, we finally broach the subject of designing and implementing a horseless carriage. Ironically enough, Henry Ford did not invent the automobile, neither did he come up with the idea of an assembly line; he made cars accessible and affordable for consumers. That is spirit of success behind the horseless carriage. My answer to the Success Dilemma in Healthcare? Let us unify and disrupt ourselves; together, forge a better, stronger, and sustainable future to turn this social burden into a societal value. I like the idea behind value based healthcare. I believe we will have a hard time implementing value based healthcare until we minimize the role of 3rd party payers. For the CONSUMER to take the lead role they must have more skin in the game. May cash paying patients are very aware of the value of PT. They rarely want unnecessary additional imaging or testing, they are frequently the most compliant with their HEP, and they rarely stay longer than medically necessary. However, my insurance based patients, especially those with little to no co-pays are frequently the ones seeking additional MRI’s, are not as compliant with their HEP, and often seek additional unnecessary medical care. 3rd party payers have (chosen to otherwise be) been contributing to the problem as much as providers billing for services as an earnings statement. Consumers will need to have more skin in the game; MONEY always talks. If they can get more money or spend less, things will start to shift. It is important to reach more recipients. Upcoming Webinar: "Advanced Branding Concepts"